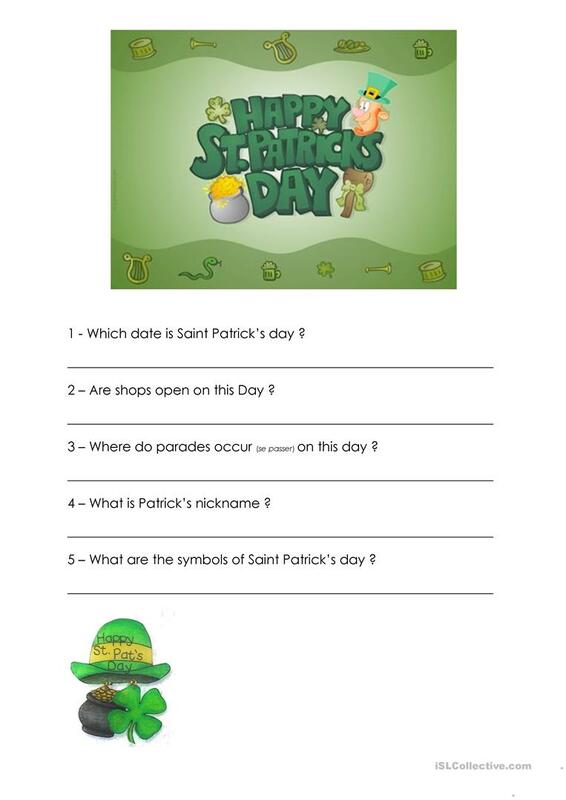 Questionnaire about Irish national day. Easy questions designed for A1-early A2 students. The present downloadable worksheet is meant for high school students at Elementary (A1) and Pre-intermediate (A2) level. It is aimed at teaching Questions in English, and is a valuable material for working on your groups' Reading and Writing skills. It features the vocabulary topic of Culture, intercultural communication, cross-cultural communication. isacesar is from/lives in France and has been a member of iSLCollective since 2012-09-13 15:00:11. isacesar last logged in on 2018-06-14 21:48:30, and has shared 1 resources on iSLCollective so far.